NEW YORK, NY--(Marketwired - May 03, 2016) - IC Media Direct, a New York City and Washington DC-based Public Relations and Reputation Management agency, provides specialized insight on the significance of online reputation for individuals and businesses. For more than 20 years, the reputation experts have been offering brand repair services to elite individuals and Fortune 500 companies and improving their online status. This year, IC Media Direct received the New York Excellence Award from the Small Business Institute for Excellence in Commerce (SBIEC) for the third consecutive year, after demonstrating strong business ethics and corporate values. 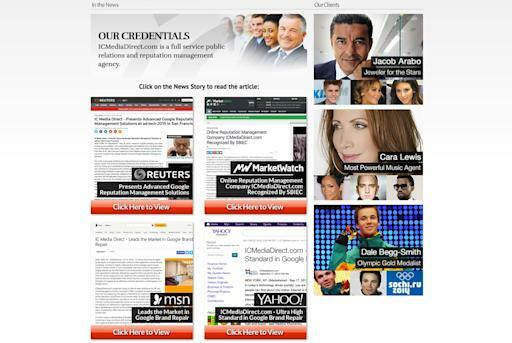 See your Online Reputation Report now, by visiting http://www.icmediadirect.com. Companies that try to establish a strong Internet presence and build trust among its consumers often overlook the importance of reputation management. Local business directories make it easy for customers to review their personal experience with a brand, and corporations should remain aware of how their enterprise is observed by potential clientele. According to the professionals at IC Media Direct, "what people say about your company has become the most significant reflection of your reliability and services. In essence, you are what people find about you online." It is important for companies to evaluate customer reviews and adequately address any negative feedback. 70 percent of buyers admit to being affected by online disapproval by others before making their own purchase, and any criticism might deter them from selecting the products or service offered by a specific company. There are many ways of handling negative reviews, and IC Media Direct outlines the best approach of responding quickly to rectify any issues offline. "Negative feedback shouldn't be taken lightly, as it can help brands identify their weak points and improve the quality of their daily business operations," says a spokesperson for IC Media Direct. Brand repair should be an essential part of a business' marketing strategy due to the significant impact of a negative online reputation and its direct effect on previous marketing efforts. When customers go online to learn more about a company or product, discovering bad reviews almost always drives them to a competitor. When no such information is available from real customer reviews, consumers often choose not to take any risk and do not complete transactions for potential sales.